My new RealClearPolitics.com column examines Obama’s upcoming trip and the debate between “realists” and “idealists” on Russia. I go back and forth on how real or meaningful the rumored Putin-Medvedev rift really is, and to what extent Medvedev is really emerging as his own man (or a reformer). We may learn a lot next week. More Kremlin follies: Russia vs. Georgia, redux? In a depressing sequel to its petty and destructive war against Georgia last summer, Russia has now cast a petty and destructive veto in the United Nations Security Council, compelling the abrupt withdrawal of 130 badly needed international military monitors from Georgia’s secessionist region of Abkhazia. It was petty because Russia’s larger interest lies in calming, not stirring up, secessionist ambitions in the Caucasus, a violently fractured part of the world that includes other restive regions like Chechnya. And it was destructive because whatever hopes the Russian-backed Abkhazian separatists might still retain for a semblance of international legitimacy vanishes with the withdrawal of the United Nations mission. Moscow’s heavy-handed meddling has isolated Abkhazia, and Russia. Only Russia and Nicaragua recognized the “independence” Abkhazia proclaimed after the Russian incursion last summer. This month Russia voted alone in the Security Council to evict the monitors. They could have added that Russia suffered an embarrassing setback in its quest for recognition for Abkhazia and South Ossetia when former pal Alexander Lukashenko of Belarus took the first half a $500 million loan that was a tacit bribe for recognition, and then didn’t come through. The Times is quite right that further destabilization and growth of separatism in the region would be detrimental to Russia more than anyone else; hardly a day goes by without deadly violence, including assassinations of high-level officials and military officers, in places like Ingushetia and Dagestan. But of course, for the Kremlin leadership, muscle-flexing and ego-tripping counts for a lot more than such practical considerations. Meanwhile, Russia is planning large-scale military exercises near the Georgian border; not only will these exercises take place in “independent” Abkhazia and South Ossetia, but they are pretty clearly directed at Georgia — at the very least, to send a signal. Adrian Piontkovsky, writing on Grani.ru (Russian text), speculates that Russia may be preparing for Georgian War II. In response, Mr. Glazunov promised to make it longer, and the National Leader gave himself a pat on the back for having a good eye for detail. In Novaya Gazeta (alas, Russian only), the brilliant Dmitry Bykov comments, in hilarious verse, on the encounter between the artist and the prime minister (who also chided the Russian Orthodox Holy Martyrs Princes Boris and Gleb, depicted in another Glazunov painting, for submitting to martyrdom rather than defending the Motherland), and imagines other conversations with artists in which Putin might want to do something about the naked Bacchus. Today marks Dmitry Medvedev’s first year in office. But is he President Medvedev or “President” Medvedev? 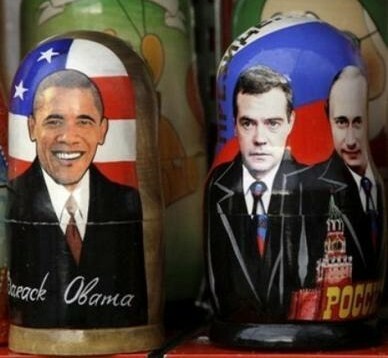 Is there a harmonious “tandem” or a Putin/Medvedev rift? So far, the difference between Medvedev and Putin is mainly a matter of style and tone. Will style become substance? Could Medvedev be a genuine reformer who must tread carefully because he is still hobbled by the presence of Putin and his faction? Is he an ambitious man who wants to free himself from his mentor’s shadow, and prepare the ground for a second term, by using a mostly cosmetic liberalism to build a power base? Will the rumored discord in the Putin/Medvedev “tandem” become a full-scale war of Kremlin “clans”? 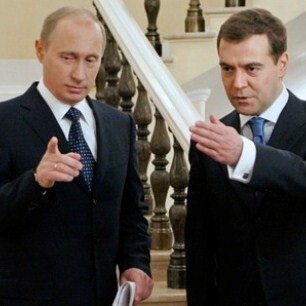 Or is Medvedev playing “good cop” to Putin’s “bad cop,” primarily for Western consumption? “Only time will tell” may be the tritest of conclusions. But in this case, it is the only one that seems fitting. An interesting article on Medvedev’s liberal moves appeared in the “Russia Now” online supplement to The Daily Telegraph (UK), produced by Rossiyskaya Gazeta — the official publication of the Russian government. In other words, this is what the Kremlin’s mouthpiece wants to tell an English-speaking audience. Medvedev’s interview to Novaya Gazeta, in a rather stilted but readable translation, can be found on the newspaper’s English-language site. And here is Medvedev’s LiveJournal (seriously). For those who read in Russian, some good expert opinions on Medvedev’s first year and the “tandemocracy” are offered here. For those who don’t read in Russian, here’s a translation of the most interesting quote.